This month I posted 24 entries, listened to 795 songs, watched 2 videos, bookmarked 6 sites, took 9 photos and favorited 12 things. If you were to ever spend an unusual amount of money on a gift for me, this is it. These sneakers are going for about $360 + international shipping, but I've considered getting them several times. I may have a sickness, but these sneakers are beautiful. If you want to buy them for me or (gasp!) for yourself, you can find them at the kix-files shop. The full name of the shoe is the Nike Dunk Low Premium SB SBTG, with SBTG standing for Sabotage (a.k.a Mark Ong) of Royale Fam. Here's an interview with Mark from the latest Sneaker Freaker. The 7th installment in the Up Series, which is a documentary series that revisits those remaining from the fourteen people profiled in the original film every seven years. The movie is out on October 3rd. Yesterday, Kottke posted a story from the New York Times called, "A Big Star May Not a Profitable Movie Make". While there is no definitive answer, it seems that there are only a handful of superstars that can create significant financial success for a film; the rest don't make much of a difference. In one study, Mr. De Vany and W. David Walls, an economist at the University of Calgary, took those factors into account. Looking across a sample of more than 2,000 movies exhibited between 1985 and 1996, they found that only seven actors and actresses â€” Tom Hanks, Michelle Pfeiffer, Sandra Bullock, Jodie Foster, Jim Carrey, Barbra Streisand and Robin Williams â€” had a positive impact on the box office, mostly in the first few weeks of a film's release. In the same study, two directors, Steven Spielberg and Oliver Stone also pushed up a movie's revenue. But Winona Ryder, Sharon Stone and Val Kilmer were associated with a smaller box-office revenue. No other star had any statistically significant impact at all. So what are stars for? By helping a movie open â€” attracting lots of people in to see a movie in the first few days before the buzz about whether it's good or bad is widely known â€” stars can set a floor for revenues, said Mr. De Vany. That sounds about right to me. In fact, it reminds me a lot of the the Long Tail. There are a few really big stars that drive a ton of money to the box office, which may account for 70% of the star power out there (let's say). Then there's a group of maybe 100 actors who account for the next 10% and the tens of thousands of other actors out there account for the final 20%. Below is my incredibly crappy attempt at a Long Tail graph (the first two sections should both be much smaller). Each of the three groups are interchangeable within their groups assuming they fit the needs of the film. Fitting the film is key as a crappy film will do bad no matter what and putting Julia Roberts in the starring role of How High 2 just won't break the box office bank (even if the Snakes on a Plane set would love it). Another of the economists agrees with me. Moreover, even if a star-studded movie does well, it does not necessarily mean that the stars are causing higher ticket sales. In fact, it seems to move the other way around: stars select what they believe are promising projects. And studios prefer to put stars in movies that they expect to be a success. What's the answer? Make an entertaining movie and you'll make money. While a star can add entertainment, there are only a handful that have an impact on an otherwise crappy movie. Since my knowledge and research skills are lacking, if you know any films that failed/succeeded because of/in spite of an actor, please post it in the comments. That price tag "would be the biggest deal for a single U.S. property in modern times." Last night, I made a trip to Bamn! with Adam of Slice and AHT fame. Bamn! is an automat, which means there are vending machines that provide hot food. The establishment also has a counter where you can order drinks, soft serve ice cream, fries and hot food made to order. Below is a very TGWAE-like photo recap of my trip. If you don't feel like following along, know that the food we sampled was average save for the fries and the mac & cheese kroket, but the experience was novel for the likes of me. You can view a flickr photo set here. You can see it's a pretty typical automat. You put in money, open a small glass door and an edible item is waiting for you. They also have a menu that you can order items from. As I said before, these are made to order. 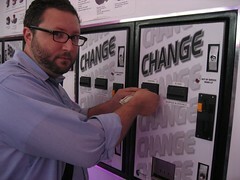 The change machine is pretty self-explanatory. 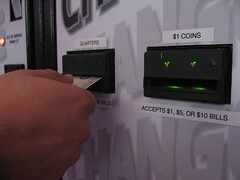 You put in paper money and you get quarters or dollar coins (they happened to be out of dollar coins during our visit). At this point, we made our way to the food. To avoid clogging up my entire front page with this post, you'll have to click through if you're reading this on the homepage. Video: Acoustic Cover of Outkast's "Hey Ya"
Since the beginning of the year, Henry Abbott of True Hoop has been trying to figure out who William Wesley is. People have seen him sitting at Cavs games watching Lebron, traveling around the world with NBAers and at exclusive parties but there was virtually no mention of him in the press. So, Henry has spent the last 8 months figuring out who this guy is. Today, he posted a succinct recap of everything he knows. It turns out Wesley provides business sense for players who haven't developed any yet. Players need someone who knows the ropes, a mentor, an advisor, an uncle. Enter William Wesley. How's this for a resume? He was right there in Michael Jordan's ear. The whole time. "Wes" helped pull off one of the great feats of modern legend-making. He held the hand of one of the NBA's less likable characters—an angry, cussing, yelling, gambling, adrenaline addict with some sort of over-competitive personality disorder—as he became the most successful pitchman in sports history, complete with his own animated children's movie. Great, but how does a guy like this make money? Henry covers that too. As many different things as you can possibly imagine. There is an entire informal economy available to those few with the power to boss celebrities around. All indications are that dozens of the best basketball players in the world, players like LeBron James, Allen Iverson, and Richard Hamilton, take Wesley's advice very seriously. Players like that are essentially corporations—with the potential to make those around them very wealthy. There's so much more to the story in his post and it's a great look at an unseen side of the NBA. With over 100 gigabytes of music on my computer, you could safely call me a music junkie. What seperates me from the pack is I'm a melody first guy. Most of my friends, especially the ones who are music junkies, focus heavily on the lyrics. The melody is important, but seems to be a given; it's the finely crafted words that make it an amazing song. That's why I was happy to hear one of my favorite songwriters, Matt Hale of Aqualung and previously Ruth and the 45s, say that music always comes first for him. Aaaaaanyway, after his afternoon's work you can hear an intricately wrought song idea with a vocal that goes 'woo-woo'. Matt has written a lot of excellent words for his songs over the years, but I don't know of any song of his that started with lyrics. Melody is his primary interest as a songwriter. Sometimes words come along with the tune, but if they don't, most of the time he'll sing a woo-woo version and ask me or Kim to turn the woos into words. Where do you stand on this debate? Are both strong lyrics and melody necessary for a great song? Yesterday Gothamist linked to the Brooklyn Botanical Gardens page as their Amorphophallus titanum flower is starting to bloom. They have a webcam refreshing every 30 seconds showing the flower and it's blooming right now! This flower is referred to as the "corpse flower" because it is so stinky when it blooms. Too bad the webcam doesn't have smell-o-vision. Update (6pm): The NY Times just put up an article about the flower. The last time the species bloomed in NYC is in 1939 in the Bronx. "People will say, 'Do you have a dead animal in here?' " said Patrick J. Cullina, vice president of horticulture and facilities at the botanic garden, who has worked with similar plants of different species. The literature posted beside the harmless-looking plant describes what to expect, the "revolting smell of putrefying meat." Video for Thom Yorke's "Harrowdown Hill"
Holy Crap It's a Meat Cake! "Even the biometric lock is intelligent, sensing for bloodflow and the correct fingerprint to foil those unscrupulous fiends who found a way past the first generation fingerprint locks by hacking off the fingers of their victims."